For my birthday I received a copy of the book The Making of Pride and Prejudice, which pleased me very much. So as I've been poking through there, I've been gleaning all sorts of new and interesting trivia facts, so I decided to compile a little quiz. All you have to do is identify the facts as true or false. 1. 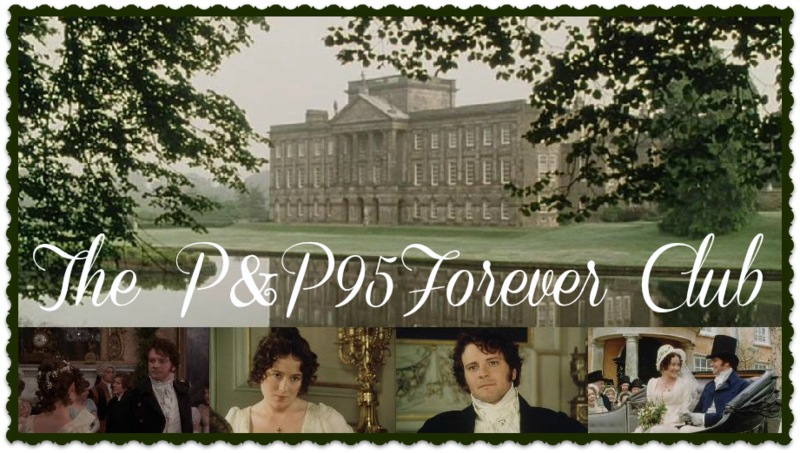 The lady who owned Luckington Court (Longbourn) and let her house be disrupted for the filming was offered the role of an extra in P&P, but declined. 2. The actors who played Sir William and Lady Lucas were married in real life. 3. Colin Firth had read Pride and Prejudice before being offered the role of Mr. Darcy. 4. Jennifer Ehle first read P&P when she was twelve, and adored it (and Elizabeth) from the very first. 5. Lucy Davis (Maria Lucas) originally auditioned for Lydia Bennet. 6. Crispin Bonham-Carter was partially chosen because he looked distinctively different than Colin Firth's Mr. Darcy so that no one would get them confused. 7. Susannah Harker (Jane) and Jennifer Ehle (Lizzy) both had wigs made to play their characters..
8. There was a slight panic when the dance scenes at Lucas Lodge were about to be filmed, because somebody had recently waxed the floor and it was far too slippery to dance on. The polish wouldn't come off so someone finally suggested un-slip-ifying the floor by mopping it with Coke, and it worked. Answers will be posted this weekend. 3. False? I know his brother had read it, judging by his comments when Colin was cast! 2.Err... fifty-fifty chance... I'll say... True. 7. False. That is Susannah Harker's real hair. 8. Oh, you little sneaky one! You allllmost got me! But I've read the that chapter in the making-of book. Hehe. The Coke did NOT work--they all stuck to the floor when they tried to dance on it after it was cleaned with Coke. FALSE. OK,for most of these I really have no idea, but I'll try just for fun. 3. Well, if I were him, I would have read it, so true. 8. That just seems way to far fetched to be true, so false. Is the Making of P and P in anyway inappropriate? Any bad language, inappropriate pictures? Hmmm... I don't remember that. What I was reading was a narrative by Polly Maberly (Kitty Bennet) and what she said at the end was "the cue for the dancing was given, the piano started, we ran on to the floor and all stuck fast!" and I think she just meant that they didn't slip, not that it was too sticky. Well, there were a number of things in it that *I* wouldn't write, but I didn't notice anything really bad. And there wasn't that much I was uncomfortable with so a lot could probably be scanned over. However, I haven't read the whole thing from cover to cover. @Miss Marianne: Yes, that's the sentence I was referencing as well, but I always thought it meant the coke made the floor very sticky and their feet got stuck to it. Thanks. I wouldn't want to get a book that is inappropriate.